It has been a snowy few days in many of the main ski regions of the world with the Western Alps, Pyrenees, Scotland (where the ski season has started), Scandinavia and Far Western North America benefitting in particular from cold temperatures and, in some cases, large accumulations of snow – the biggest reported 1.25m in 72 hours at Lake Tahoe. Even Amsterdam has had snows falling and ski areas in southern Belgium have opened with 15cm of snow falling. The good news is not entirely universal. Conditions in Eastern North America have been described as ‘Springlike’ by one of the biggest players, Killington in Vermont although colder weather is now expected from later today onwards and the Rockies could do with more snow south of the Canadian border. 30-80cm of fresh snow in the French Alps has set the country up for a great early season. 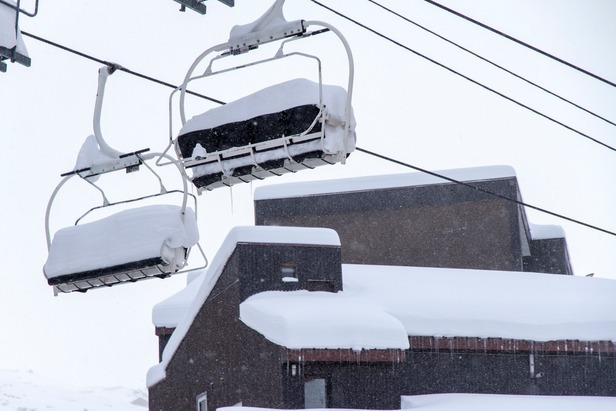 Val Thorens has recevied 70cm of fresh snow since Monday giving it a whopping snwo base: 110cm-160cm (lower/upper slopes). 32 slopes and 18 ski lifts are open, with more scheduled for this weekend. The new snow has been great news for several top resorts which opened at the weekend. Les 2 Alpes opened Saturday with a base of 40-90cm. Val d'Isère also opened with 50cm of frsh snow, giving it a great base of 30-70cm. The resort’s tourist office issued a statement saying, “White is back everywhere to enable a beautiful opening weekend.” The Espace Killy link to Tignes also opened. It’s snowing in Meribel which is due to open this Sat. Dec. 8. Up to 30cm of fresh snow has fallen, giving an accumulated base of 30-110cm. Many more resorts will open this coming weekend and will benefit from the new snow with big names including Alpe d'Huez, Chamonix, Les Orres, Serre Chevalier and Pra Loup (in the Southern Alps), Peyragudes and Saint Lary (in the Pyrenees). They’ll join other "major" ski resorts already open with good conditions, including Tignes, which has had 90cm since Monday giving it a great base of 70-90cm; Les 2 Alpes (40-90cm) and Montgenèvre (60-100cm). There have been some good snowfalls in Austria in the last 24 hours: Ischgl (20cm), Solden (14cm) and Hintertux (10cm). Snow depths are up as high as 1.55 metres at resorts like Obergurgl-Hochgurgl. More big name resorts will be opening for the season over the next few days thanks to the fresh snow, including St Anton on Thursday, Dec.6 which now has a base of 30-75cm and on Friday, Dec. 7 Mayrhofen (10-110cm) where 10 lifts will be operating and Saalbach Hinterglemm (10-30cm). Dolomiti Superski, the world’s largest fully-interchangable lift pass network with 1,200km of piste when fully operational, opened last Saturday for the season with 50cm of new snowfall. To start with 87km of runs served by 59 lifts were open, the largest single sector Alta Badia (35-90cm) with 12km of runs. Elsewhere in Italy resorts that had opened already in October and November including Cervinia (65-200cm) and Livigno (5-116cm) remain in great shape with fresh snow and low temperatures for snowmaking at all altitude levels. There have been massive snowfalls in Switzerland in the last 36 hours with up to 80cm accumulating so far. 80cm has been reported in Verbier giving it a base of 30-160cm; 50cm in Saas Fee (88-255cm) and 50cm in Gstaad Glacier 3000 (30-140cm). It is still snowing in most Swiss resorts today. All the new snow means that Swiss resorts are now reporting the greatest snow depths in Europe led by Saas Fee with 2.5m while Andermatt has 2m, Verbier 1.6m, Gstaad 1.4m, Zermatt 1.3m and St. Moritz 1.1m. The ski season is now underway in the Pyrenees with all the major ski areas opening at the weekend. In Andorra, the Arcalis sector in Vallnord now has 40-70cm and Grandvalira has 30-60cm, while over the border in Spain Baqueira Beret (50-70cm) has reported healthy snow falls too and plans to open 120km of piste this weekend. Up to 36cm of new snow is expected in the area over the next few days and temperatures are well below zero so it’s good snowmaking weather too. It has been another great skiing weekend in Scandinavia although its freezing now and heading down towards 30 below in Norway this week. The ground freezes well and resorts are making huge amounts of snow. In Hemsedal conditions are already of good mid-winter quality with everything open. Oslo Winter Park, Tryvann (10-15cm) will open this week and over in Sweden the leading resort of Åre reports good conditions and further improving with more terrain opening. Up top the off-piste is very good there too. Resorts are expected to produce snow at full speed all week but no significant snowfall is forecast before next weekend. There are no reports of Eastern European ski areas opening yet but temperatures are largely well below zero and there has been natural snowfall as well as good snowmaking conditions so areas like Bansko will open any day now. Conditions have improved dramatically in Scotland. Cairngorm and The Lecht opened on Saturday starting the ski season each with limited terrain open, but ongoing snow showers and sub-zero temperatures which are expected to continue in to next week have allowed them to open more terrain and the country’s other three ski areas may now open in the next few days too. The snow is continuing to fall in abundance in Western Canada, Whistler has received 50cm of snow in the past 72 hours and is upper slope base depth is now nearly 2m, a similar snowfall is expected over the next 72 hours. All other Western Canadian resorts are reporting great conditions, if not, in most cases, quite so much snow. Lake Louise for example has a 30-80cm base. “Thanks to early season storms, The Lake Louise Ski Area was the first in the world to be wide open. Last season was a record-breaking year for snowfall and conditions at the start of this season are just as epic,” said Proprietor Charlie Locke. Conditions in USA remain a little challenging in places, particularly in New England, but there have been heavy snowfalls on the far Western side of the country with big falls over the weekend reported at resorts in California including a 1.25m at Heavenly which now has a 127cm upper slope base depth, much of it powder, and 1.2m at Sun Valley in Idaho. Snow cover at resorts in Colorado and Utah is currently lower than most resorts would hope (typically below 50cm) but snow is forecast to be arriving later this week. More heavy snow is expected in the Alps and low temperatures for snowmaking too. We’re forecasting more than 60cm at Chamonix over the next 72 hours and temperatures dropping below -20C at times at the top of the runs. Temperatures are dropping in North America too and areas needing snow like New England and the Colorado Rockies are expected to receive some in the next 3-6 days. It will stay cold and, if anything, get colder in Scotland and Scandinavia too. The next "Where is the snow in Europe and North America" report will be published Wednesday, Dec. 12, 2012.